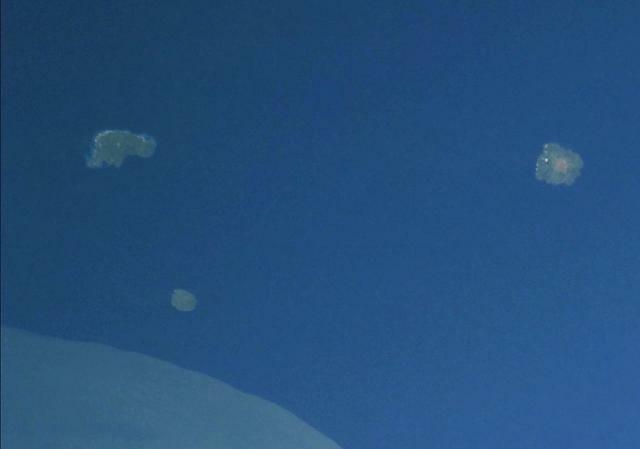 During aerial inspections 6 and 19 March, a 1-km-long zone of orange sea discoloration was noted at the S shore of Bam Island. The Global Volcanism Program has no Weekly Reports available for Bam. 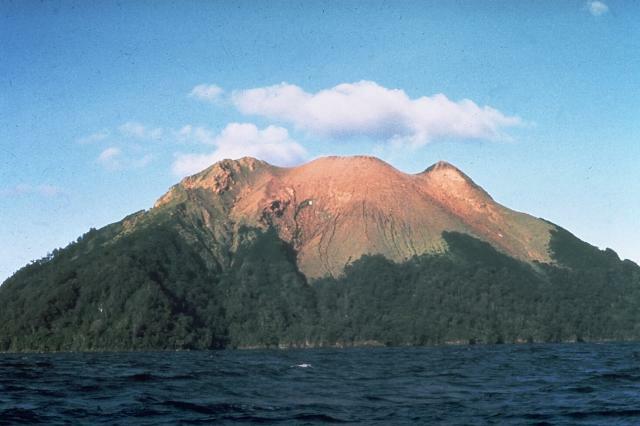 The small 2.4 x 1.6 km island of Bam is the summit of a mostly submerged volcano that is one of the more active in Papua New Guinea. Bam is the SE-most of the Schouten Islands, and lies off the coast of New Guinea, about 40 km NNE of the mouth of the Sepik River. A steep-walled summit crater that is 300 m wide and 180 m deep is the source of recent eruptions, which have kept the upper half of the cone sparsely vegetated. A NE-trending landslide scarp extends across the upper part of the andesitic volcano from the SW coast, and a large submarine debris-avalanche deposits lies to the S and SW. The younger summit cone partially buries the eastern side of the collapse scarp. A recent lava platform on the N flank supports the small island's only villages. Historical eruptions, recorded since 1872, have been restricted to small-to-moderate explosive activity from the summit crater. Cooke R J S, Johnson R W, 1981. Bam volcano: morphology, geology, and reported eruptive history. Geol Surv Papua New Guinea Mem, 10: 13-22. Hantke G, 1959. Ubersicht uber die Vulkanische Tatigkeit 1954-1956. Bull Volcanol, 20: 3-36. Jackson, H R (Captain), 1918. Log of the HMAS Una. Transcribed by Old Weather (www.oldweather.org), 2016 (see http://www.naval-history.net/OWShips-WW1-18-HMAS_Una.htm, http://oldweather.s3.amazonaws.com/ADM 53-66374/ADM 53-66374-010_0.jpg). There is no Deformation History data available for Bam. There is no Emissions History data available for Bam. The small 2.4 x 1.6 km island of Bam, seen here from the south, is the summit of a mostly submerged volcano that is one of the more active in Papua New Guinea. A steep-walled summit crater that is 300-m wide and 180-m deep is the source of Bam's recent eruptions, which have kept the upper half of the cone sparsely vegetated . A younger cone (center horizon) formed inside a SE-facing landslide scarp. Historical eruptions, recorded since 1872, involved small-to-moderate explosive activity from the summit crater. Photo by Wally Johnson, 1970 (Australia Bureau of Mineral Resources). There are no samples for Bam in the Smithsonian's NMNH Department of Mineral Sciences Rock and Ore collection. Large Eruptions of Bam Information about large Quaternary eruptions (VEI >= 4) is cataloged in the Large Magnitude Explosive Volcanic Eruptions (LaMEVE) database of the Volcano Global Risk Identification and Analysis Project (VOGRIPA).